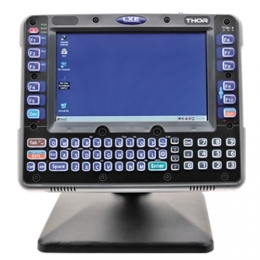 The Honeywell Thor vehicle terminal, formerly from LXE, offers forklift drivers in warehouses and in production environments a wide functionality spectrum. It contains a large touch display with a screen size of 20.3 cm 8, and a complete keyboard, including practical function keys. The display is available as an indoor version with 400 nits, as well as an outdoor version with 900 nits, for optimal readability. WWAN and Wi-Fi ensure for reliable connection to company networks during operation. Thanks to its clever Smart Dock cradle, it enables you to move the Thor from one vehicle to another in seconds - while in operation. Its built-in battery bridges all connections and applications for up to 30 minutes. Replace the front panel directly on-site in case of damage, plus gear it up for operation in cold storage. Inside lies an Intel Atom Z530 processor with 1.6 GHz, 1 GB RAM and a separate graphics processor for optimal performance in most applications.